How many times can I use the same receipt? Can I redeem multiples of the same item? Can I buy everything on one receipt? Can I use a receipt from last week to redeem this weeks Checkout 51 cash rebate? Can I get a receipt from any store? Can I submit multiple receipts each week? Do I have to submit the receipts on the same day I bought it? When is the last day to submit my Receipt for Checkout 51? Why was my Checkout 51 receipt rejected? Can my friend use my same receipt? 1. How many times can I use the same receipt for Checkout 51? You can only use the receipt once. You cannot transfer between people or devices. The receipt must be unique per account and per device. 2. Can I redeem multiples of the same item in the Checkout 51 app? No. You can only 1 of each item in the list of Checkout 51. Checkout 51 will not reimburse you if you purchase more than one of the item listed on their list. For example, if they list a $1.00 cash back for a box of Kellogg’s Nutri-Grain bars. You cannot purchase 2 boxes of the bars and expect to get $2.00 back. If you scan in the receipt, they will only give you $1.00 for that purchase. 3. Can I buy everything from Checkout 51’s list all on one receipt? Sure. You can purchase everything on Checkout 51’s list on one receipt. 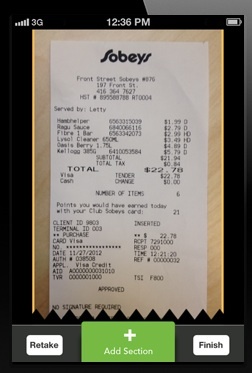 When you scan in the receipt, you will just ‘Add Section’ to the bottom so you can capture the whole receipt. After you scan in the receipt, there is a screen with checkboxes where you can select all the items on your receipt. Make sure your receipt is clear and readable. 4. Can I use a receipt from last week to redeem this weeks Checkout 51 cash rebate? No. If you purchased an item last week that is on this week’s Checkout 51 cash rebate list, you cannot use that receipt to get a cash back. The cash back is only valid for each week from Midnight Thursday to the following midnight Wednesday. If you try to submit an old receipt, Checkout 51 will reject your receipt. 5. Can I get a receipt from any store? Yes. You can purchase items from Checkout 51 list from any store in Canada. As long as you paid for it and it’s within the valid offers week, you can scan in that receipt to get cash back from Checkout 51. 6. Can I submit multiple receipts each week? Yes. You can submit as many receipts as you want throughout the week for items you purchase off the Checkout 51 list. You can buy on Sunday, submit a receipt. Buy something on Tuesday and submit another receipt. There is no time, frequency or date restriction. The only thing you have to care about is the offer valid period. Make sure you submit all the valid receipts within the current week. 7. Do I have to submit the receipts on the same day I bought it? No. You can buy your Checkout 51 item and have the receipt ready on Friday but scan on Saturday. You don’t have to purchase and scan on the same day. Just be careful because all Checkout 51 cash rebates are limited offers. If it is a popular item, you should scan in your receipt as soon as possible. Once Checkout 51 reaches it’s limit, no other receipts are accepted. 8. When is the last day to submit my Receipt for Checkout 51? Checkout 51 offers go live Thursdays at 12 a.m. in each time zone. They expire the following Wednesday at 11:59 pm. So you must submit your receipt before the following Wednesday 11:59pm AND before Checkout 51 reaches it’s limit of cash rebates it can hand out for that offer. 9. Why was my Checkout 51 receipt rejected? 10. Can my friend use my same receipt? No. Each receipt is to be used only once. It’s understandable if it’s a friend or family and you accidentally scan in the receipt more than once. But unfortunately, the first person who scanned and submitted the receipt will get the cash rebate. You can start saving money by using the Checkout 51 app. Download Checkout 51 app for free from Checkout51.com and Apple AppStore. Checkout 51 – What does “Not Many Left” Mean? How Do I Upload a Receipt on Checkout 51? Can I Use an iPad or iTouch Without a Camera for Checkout 51?